Step Up to Concept Series™ Maple Exotic Drums. 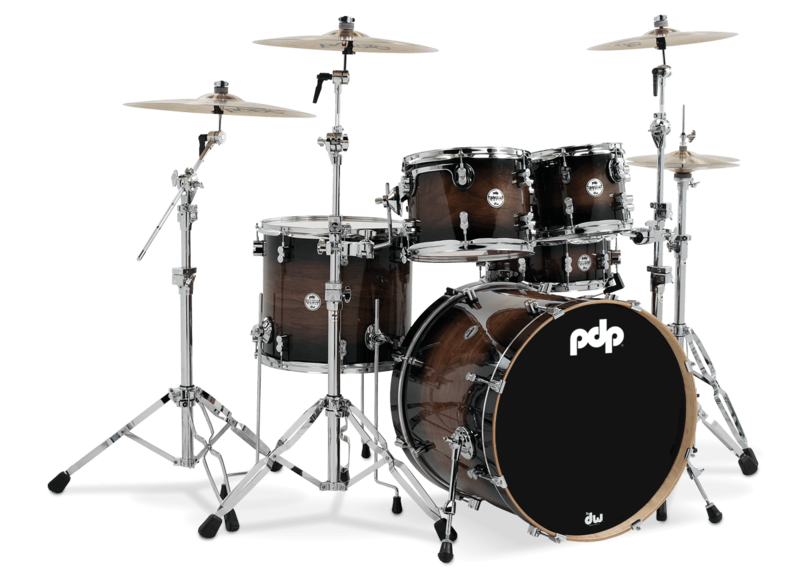 The PDP Concept Series™ introduced drummers to original, boutique-style drums with professional-grade features. Drum Workshop has become synonymous with incorporating exotic wood veneers in their high-quality drum shells. So, PDP brought these two innovations together to bring you our Concept™ Maple Exotics. Concept™ Maple Exotics drums are constructed with maple shells, wrapped in an outer veneer of rich walnut, and finished with a glossy, Charcoal Burst lacquer so, you can count on these drums to turn heads wherever they go. Then, the Concept™ Exotics offer the same, pro-level features as their Concept™ Maple and Birch cousins. The 7-ply toms come in our F.A.S.T. (Fundamentally Accurate Sized Toms) sizes for maximum resonance. The rack toms utilize DW’s advanced Suspension Tom Mounts (STMs), while the floor toms stand on our strong, resonant legs. The 10-ply snares include the trusted MAG throw-off, along with fully-chromed snare wires, featuring carbon steel coils and brass end plates. The 7-ply bass drums are built with die-cast, low-mass claw hooks. Finally, just like all Concept™ drums, the Concept™ Exotics are made with DW’s True Pitch tension rods, graduated counterhoop thicknesses, our retro-inspired, dual-turret lugs, and world-renowned Remo drum heads. And the sound? Concept™ Exotics fill the room with extraordinary warmth and projection. They are also customizable with add-on toms to adapt to a wide variety of musical styles. Want to get attention with your look and sound? Try the Concept™ Maple Exotics and you’ll quickly understand why so many drummers are flocking to PDP.